An in-depth look into Duromax XP12000EH engine. Wonder which high power quality generator you should get for your home, business, or recreational use? If you’re still confused, then let us give you a suggestion! It’s Duromax XP12000EH dual fuel portable generator deserving your attention seriously. Powerful and versatile, this machine runs on either gasoline or propane that can supply all kinds of electrical devices for your needs. This 12.000 watt generator helps you stay powered comfortably through any storm. No surprising at all when it’s usually called with the “Beast” nickname. For more detail, check out the review for the dual fuel XP12000EH below! Why Should You Choose Duromax? #1: Is it easy to assemble? #2: What is the maximum wattage? #3: Does it have the electric starter? #4: Does this generator have wireless remote start capability? Duromax is a California-based company. Unlike some of their competitors, Duromax manufactures and launches their own engines. Since they are a local US manufacturer, their designs follow ETL and MTL standards. Very convenient, Duromax supports the shipment of any replacement part to all places over the globe. Rest assured when buying the XP12000EH generator as the company offer an extended warranty option (2 – 3 years). All of their products have the warranty period beyond one year, giving customers complete peace of mind with their service. 18 HP engine accepts high-wattage loads with ease. Like other dual-fuel generators, Duromax XP12000EH can be set up at ease. However, the only issue is that you might need some help with the lifting while installing the wheel kit and handles. After the installation, the user must add the engine oil and connect the battery with ground cable. Remember to charge the battery if it is flat, and then simply fill it up with gas or propane. Finally, pull the recoil start or turn the electric key to run the generator for navigation. Considered as the best portable propane generator, this XP12000EH model is presented to operate at a maximum starting wattage of 12.000. In case you use gasoline fuel for this engine, the continuous running wattage is estimated approximately 9.500. Unfortunately, we are not really certain about the figures when propane fuel is used. 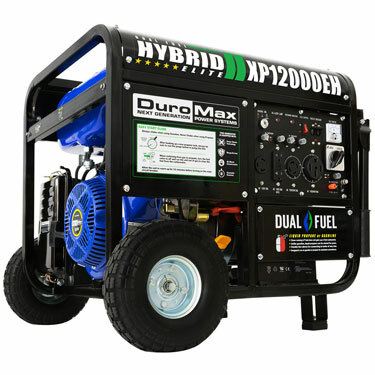 Duromax 12000 watt dual fuel generator is designed to have both electric start and recoil start. But please notice that you cannot use the electric key start if the battery is dead or if it’s not connected correctly. When your engine is running, the internal battery is also getting recharged. I advise you to buy a battery tender for the connection with the internal battery – this helps you make sure whether or not the battery is fully charged and ready to use during the stormy periods of the year. Do not ignore the recoil starter as it is a good backup especially if the battery runs out of power or is suddenly dead. Sadly, this Duromax dual fuel generator does not feature the wireless remote start. I do recommend that you shouldn’t try to install a remote starter because of the engine’s manual choke. Before you activate the circuit breaker, keep in mind that it must be warmed up for a couple of minutes. Definitely not the ideal setup for a wireless remote starter! Is Duromax XP12000EH dual fuel portable generator right for you? There must be a reason for why this engine is called the Beast. As I told earlier, the XP12000EH is an incredibly powerful generator running on both gasoline and propane. With the maximum wattage of 12000, it enables to provide the electricity for your entire house during a power outage. No need to worry about its durability! Duromax gives you a very long period for reliable service (2–3 years). 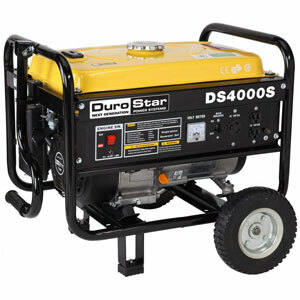 Unlike other standard gas powered generators, this machine is versatile and can support you in any situation. Cleaner and quieter, the XP12000EH has low noise levels so that you can use it comfortably in public locations. 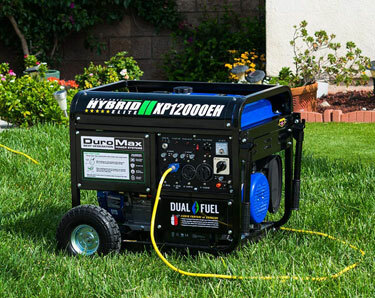 Affordable and easy to setup and use, DuroMax XP12000EH is one of the best dual-fuel portable generators on the market. You finally got your favorite Yeti cooler. You love everything about it – from its look, features to the way it performs. However, did you know that your cooler is missing something? What surprises me the most is: a large number of popular high-end coolers currently on the market aren’t equipped with built-in cooler wheels. Of course you will find some small wheeled coolers on sale. How about the large, heavy ones? The problem is – a Yeti cooler with a big size seems impossible to transport, especially when it’s filled with ice, beverages, and food. Instead of hurting you back carrying or trying to pull the cooler, now I come with a solution helping you solve this annoying problem. 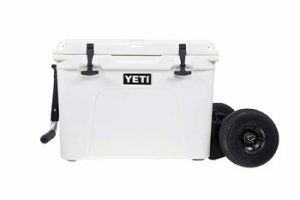 In this article, let me introduce the best wheel kit for Yeti cooler! 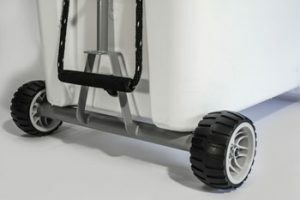 Very simple, you just need to add the wheel system to your existing cooler and, BAMM – you will have a new wheeled cooler. Well, it is designed to work compatibly with your Yeti Tundra cooler as well as the 125 model. Each wheel is 8 inches wide and able to move on all terrains (stairs, rocks, sand, or even mud). No tool or other equipment requirement, assembling Rambler X2LT is quite simple. 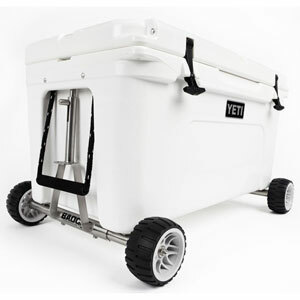 Constructed with the telescoping design, the system’s handle is connected to the Yeti cooler’s molded handles making it convenient and easy to hold or pull. While you stop for resting, the cooler wheels will stay still without displacing. At the first glance, this Rambler wheel cooler system is tough; however, the whole package is easy to use and quick to set up. No need to remove the wheels from the cooler; but if you want to, the option is available. The Rambler X2LT works with the Yeti 50-125 won’t make you disappointed. Two axels help the cooler stay balance when moved in any terrain, even the toughest ones. Your Yeti can be transferred on a truck or a boat safely with the assistance of Double Duty Lock Hook. The handle length maintains a stable distance and gives off a comfortable feeling between you and the cooler while walking. This wheel kits work well on all kinds of terrains: rocks, sand, mud, or stairs. Now relocating your heavy cooler is fast and much convenient. Product Description: The Sherpa cooler wheel kit with 16″ solid rubber tires is a handy accessory designed exclusive for heavy Yeti and RTIC coolers. The axle assembly can be done as well as the peg-locks easily slide into the cooler’s foot holes. The cam-lock straps help keep the axles in place in just a moment. This kit is a perfect choice for camping, boating, and pier fishing with your cooler. Installing the axle costs you not much time – it is adjusted quickly and stays in place easily thanks to cam-lock straps. Next, you need to slide the peg-locks into the cooler’s foot holes. Sherpa wheels for Yeti cooler are ideal for boating, pier fishing, and camping. But, in generally, it helps you carry your favorite cooler to anywhere you want to go. 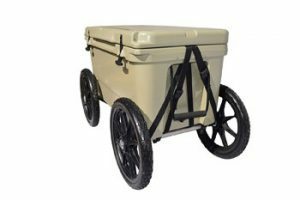 The next choice for your Yeti cooler is the wheel cart with 16-inch solid rubber tires – a product from Sherpa Hunting. 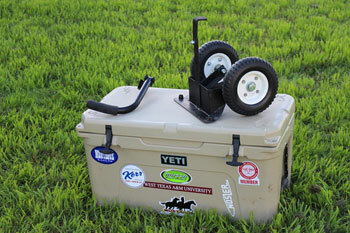 Not only work well with the Yeti, this wheel kit is also compatible with all RTIC & KONG coolers. Overall, the relocation with this kit is stable and durable as it features 16-inch diameter, flat-free wheels plus sealed wheel bearings. When purchasing a heavy cooler, it’s necessary to look for a handy accessory stopping you from straining your back; and, one of the best choices is the Sherpa wheel kit equipped with solid rubber tires. This kit includes 4 wheels, 2 axles and all straps and hardware helping attach to your cooler. Product Description: Here comes the Sherpa Beach Cooler Wheel Kit for your Yeti cooler. Rugged and easily attached, this whole package includes 4 wheels, 2 axles, necessary hardware and straps for the installation. It is made from the stainless steel material ensuring a long term of reliable use. This cooler wheel kit with 10″ pneumatic rubber tires is made for your convenience. Compatible with not only the heavy Yeti but also the RTIC coolers, it’s ideal for long-distance vacations. The installation won’t take much time as the axles and peg-locks can be adjusted on the cooler quickly. Besides, cam-lock straps keep the balance for your cooler while moving on the tough terrains. You can instantly find necessary hardware helping you attach the kit to your cooler. This product is overall great for camping; all four 10-inch pneumatic tires are sealed wheel bearing and durable enough to roll your heavy Yeti cooler to wherever you want to go. 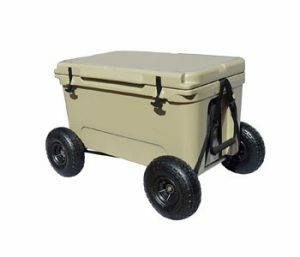 The adjustable axle matches well with Yeti Tundra 50 – 160 quart coolers; therefore, if your cooler is bigger, then quickly contact the manufacturer and provide the info for them. Product Description: Badger Wheels for Yeti Tundra 45 can handle loads up to 500lbs. This wheel kit is built to support the rugged durability of your Yeti Tundra 45 cooler. Finally your back is protected; at the same time, moving the cooler can be faster and handier. Easily carry your Yeti Tundra to and from any vehicle (truck, boat, etc. ), in and out of as well as back and forth on any platform. The cart features large wheels (4.5″ wide x 7.5″ tall); thus, it is excellent to move on sand and rough terrains. Secure the wheel assembly with easy plate and bolt lock for rugged use. The Badger Wheels take your Yeti Tundra 45 anywhere with more ease than ever. This wheel cart from Badger Wheels is constructed with the fixed width to fit YETI Tundra 45 only. The powder-coated, carbon steel design is for affordability, strength, and durability. Generally speaking, the kit is a necessary accessory for owners of the YETI Tundra 45 cooler. If you find it hard to carry your cooler when it is fully loaded, then Badger Wheels are just everything you are looking for. Product Description: These are Badger Wheels for Yeti Tundra 50, 65 and 110. The new kit doesn’t change much from the old version except the larger rugged wheels. It is all about mobility and durability with fixed width and powder-coated, cold rolled steel design. Only Yeti Tundra 50, 65 and 110 are compatible with this wheel kit. The Badger Wheels with Steel Single Axle are a rugged and easily attached wheel kit for your Yeti Tundra 50, 65 and 110 cooler. When purchase, you’ll get one single axle and 2 wheels for a package. Don’t worry about the reliability as it is built to last with the powder-coated, cold rolled steel design. The adjustable axle only fits Yeti Tundra 50, 65 and 110 perfectly. If you are wondering which wheel kit to buy for your heavy Yeti cooler, my recommendation would be Badger Wheels with Steel Single Axle. The solid construction makes it a wheel cart of durability; furthermore, two sealed steel bearings per wheel are for smooth rolling. The handles can control a cooler loading up to 500lbs. You are advised to measure your Yeti cooler before purchase. Product Description: As you wish, Badger Wheels now come with a rigid handle/stand in front. This handy accessory is designed for a wide range of Yeti Tundra and is used with one single axle. 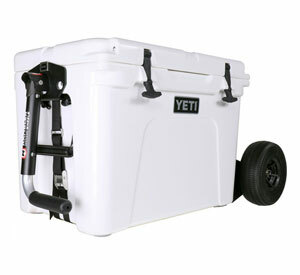 The base plate is securely mounted to your Yeti Tundra so that you can pull or push the cooler effortlessly. 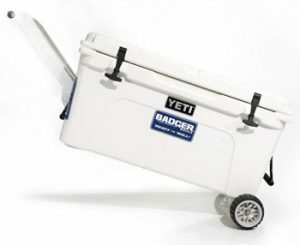 In general, the Badger Wheels with handle/stand for Yeti Tundra 35-160 provide such greater ease of use when locating your cooler. 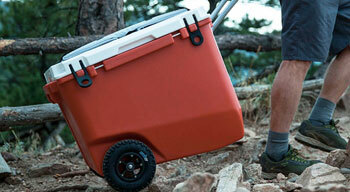 You can pull and carry the cooler up, down, and to anywhere over a variety of terrains with no effort. Give your back a recovery as this kit is adjustable to fit Yeti Tundra 35, 45, 50, 65, 75, 105, 110, 125 and 160 coolers. 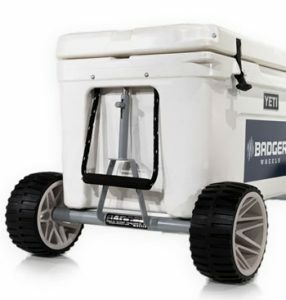 The Badger Wheels for Yeti Tundra 35-160 features a handle/stand helping you move or pull the heavy cooler without much difficulty. The whole set includes one Badger Wheels axle, one handle/stand, 2 wheels, one locking plate with bolt, and extensions (2″, 4″ and 5″). With the attached handle/stand, carrying your favorite cooler to a long-distance location is no longer a worry. Please note that Badger Wheels cannot work with Yeti having built-in triangular rubber feet. Product Description: This Large Badger Wheels have been designed to fit Yeti Tundra 35-160 perfectly. Just like other older versions, the kit is built to match the cooler’s rugged durability. Now your back won’t get hurt anymore with the support of this handy accessory. Large Badger Wheels for Yeti Tundra 30-160 has the marine-grade and 316 stainless steel design for durability, strength, and corrosion resistance. Two large wheels (4.5" wide x 7.5" tall) with sealed steel bearings help the rolling process smoother; the polyurethane wheels minimize clearance and snagging. Additionally, the handles enable to load in excess of 500lbs. The whole package includes one large wheeled axle assembly, one 3/16" hex wrench, one locking plate and bolt, and lock extensions (2", 4", and 5"). Product Description: Owners of Yeti Tundra 65 may need these Standard Badger Wheels. With the construction for Yeti Tundra 50, 65 and 110, the kit has been considered as a handy and helpful accessory, especially when you have to move around with a large, heavy cooler. Not really changing much from the older versions, but the cart does offer larger rugged wheels. Thanks to the fixed width with a powder-coated, cold rolled steel design, Standard Wheel Badger 65 is a kit of mobility and durability. Not only working well with Yeti Tundra 65, it is also compatible with the models 50 and 110. The axle assembly can be done quickly as it’s very easy to attach the wheel kit to your Yeti cooler. Quality construction, this product is built to last. Don’t know whether or not you should buy Standard Wheel Badger 65? Well I advise you to get this wheel cart for your heavy Yeti cooler. With the steel single axle and solid construction, you can be assured about its durability; furthermore, the relocation is smoother with two sealed steel bearings per wheel. Not yet, the kit’s handles are able to deal with a fully loaded cooler of 500lbs. So, have you picked the most preferred wheel cart for your Yeti cooler yet? Check out other BEST high performance cooler wheel kits if you don’t really like the options above. Clearly, with just a click, you can easily bring home a convenient wheel kit. By putting the cooler on one of these systems, you will feel much easier to transport cooler on all terrains. Save your back by purchasing one from today. No more sweating, now you can drag your favorite cooler to anywhere using the built-in handles. The energy is supposed to save for the fun and adventure of your outdoor experience. Let the wheel kit deal with a heavy cooler! Quick DIY Generator Wheel Kit Idea – Make it right now ! You must agree with me that a wheel kit is very necessary for moving your generator. These days, it’s not hard to purchase this accessory. 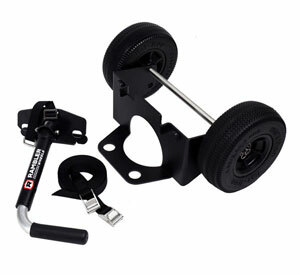 With just a simple search, you will easily find the most ideal, handy wheel kit to maneuver the bulky equipment. I do suggest you to get one to make life a little bit more convenient. There are some reputable brands of manufacturing the wheel kits that you should consider such as Champion, DuroStar, Honda, and Autoworks. Sadly, none of them offers the wheel kit for cooler, if you want to know. Have you ever thought about DIY generator wheel kit? In this article, I am going to give you the tutorial of how to add wheels to your portable generator for absolutely free. Of course, the key of this instruction is to make use of what you can find at home. What is a wheel kit for generator useful for? Even the most portable generators are still a bit weighty for you to carry, especially when you fill it up with fuel. Thus, it’s much better to equip one wheel kit for relocating your generator. Who doesn’t want to make life easier, right? A typical wheel kit includes two wheels, an axle plus all bolts, nuts, and other items needed for the assemblage. Conveniently, some wheel carts will come already installed hence you just need to place your generator on them whenever in use. How to Install Wheel Kit to Your Generator? Most wheel kits are designed to be user-friendly and easy to install. With some, you only need to set the generator on a wagon; while others, like the wheel kit series from Champion, is packed with individual pieces and parts which you must attach the wheel axel and wheels to the generator for the setup. 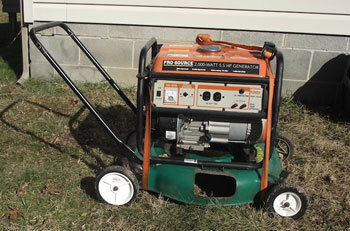 Finally, add the handle included to move your generator much lighter and easier. Remember that each generator wheel kit has the different installation manual; in other words, all companies offer their own recommendation. 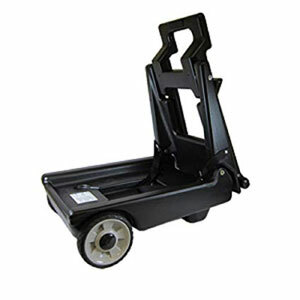 Therefore, you need to follow the step-by-step instructions for the specific wheel cart that you’ve chosen. If you look for more information about generators and the appropriate type of wheel kits, the best way is to send the email to the manufacturer. Or, simply check out all the wheel kits available on Amazon and see which one will work for you. How to Create Your Own Wheel Kit? At first glance, this accessory looks like it does not cost much; but, when I checked the price online, most of them cost around $40 to $60. That’s the reason I come up with an inexpensive solution. Firstly, I remove the engine from an old mower and keep only the handle’s lower section connected to the mower frame, such a great space to place your extension cord. Utilizing two ratchet straps and tying down the generator to the mower frame. By doing that, you now can easily remove the machine off whenever it is needed to put in the back of your truck. This setup is easy to do and assists you in moving the generator stably and smoothly. Also, it can prevent your machine from encountering the wet or snowy ground. I don’t want to brag but the idea of making your own wheel kit is brilliant. I used two air-filled tires for my portable generator relocation kit – these wheels are extremely easy to move on rough frozen ground; in addition, it much more convenient and effortless when transporting the generator on a flat place, like just rolling it out of the garage into the driveway. Save some money on the generator wheel kit! In today’s modern world, most generators are lightweight and portable. Of course not all of them! There are still some pretty weighty. Many companies then add wheels on the bulky machine for portability. However, you cannot stick with that option like forever. This is when the wheel kit makes its appearance – the flexible accessory assures to make your generator more manageable. Knowing the need of nearly all generator owners, more and more wheel kits are introduced on the market. With lots of choices, how to get a wheel kit for generator suitable to your needs? Learn more about some best wheel kits for your portable generators and see if you can find one that you have been waiting on. If you look for a versatile wheel kit for your Honda EU3000iS generator, then maybe the All Terrain Wheel Kit from Autoworks should be taken into consideration. With the heavy duty bearings and 10-inch solid never flat tires, this versatile wheel kit can handle the weight of your generator under any condition. The whole system includes the necessary mounting hardware, and 4 axle end caps. Installing the wheels to your generator is also simple thanks to the detailed instructions. No need to lift the generator, the wheel kit will help the transfer across mud, sand, or into the back of your truck much easier. Not taking too much time, the wheel kit from Champion Power Equipment is very easy to install. The package has two 8-inch never flat wheels and a steel axle. You can fold the handle away when not in use as well as take advantage of the kit’s support leg to reduce vibrations. 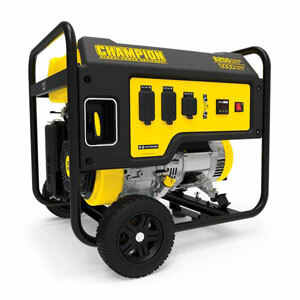 The product is designed for Champion generators 2800-4750 watts, especially the 3500W model. Champion supports 1 year limited warranty for Champion Power Equipment Mobility Kit. The DuroStar Wheel Kit is tailored exclusively for the DS4000S. The whole package includes two solid heavy duty wheels (9 inches), one fold-away handle, two support legs with vibration mounts, other necessary tools and hardware for the installation, and the instruction manual. Easy and simple to set up, the generator will stay in place once put on the wheels, much convenient to move. This kit comes with an affordable price. Make your generator portable with Honda Generator Handi Cart Kit – a must-have accessory working well with both the EU2000i and EU2000 models. 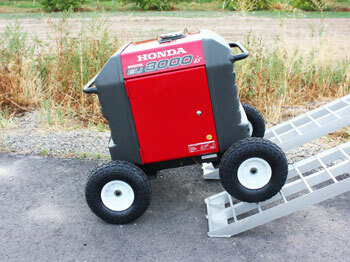 Using genuine Honda parts, this handy wheeled cart includes two wheels plus a transport strap. These smooth-rolling never-flat tires will help you transport the generator from place to place with no effort – this means you don’t have to lift the bulky machine anymore. The kit is pretty lightweight, yet strong and functional. I’ve given the list of best wheel kits for generator for you in order to help you select your favorite without wasting too much time. Surely there are still plenty of good generator wheel kits for your consideration. But, before making a decision to purchase, keep in mind to research a bit. In case your generator has no wheels and you want to save money, then it’s a good idea to check out the DIY generator wheel kit. Even the name itself speaks for itself – an ice box allows us to keep food and drink cold for days. Without a cooler, moving from place to place with the frequent change of the temperature outside during your picnic trip will cause food spoilage. Well, food products need to be stored in a stable temperature, and only the cooler can solve that issue. The thing is; there are plenty of coolers that come with different weights, not to mention the added weight of ice cold beverages. Obviously, you cannot carry, lift, or drag a too heavy cooler with only bare hands. Is there any possible way to make the cooler more manageable? Well, that problem can be solved easily with the support of the wheel. Now simply purchase and attach the wheels to your cooler for portability. So, in this article, I’m going to do a brief introduction of the best wheel kit for cooler which can help you make choice effortlessly. Firstly, the assembly of this product is very user-friendly – it is ready for the road after taking only 5 minutes for the incorporation to my Yeti cooler. Overall, the X2 system’s wheels when moving the cooler to and fro are fantastic. I often use Rambler Wheels X2 on my camping trips, and the performance of this system is functional, strong and pretty impressive. Its handle is a dual-sided telescoping handle comfortable for holding and allowing you to adjust when needed. The large all terrain wheels can be dragged over any terrain (rocks, sand, mud, or stairs). 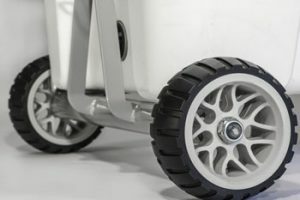 The small issues with Rambler X2 are – it is heavy; in addition, the wheels jut out about 9 inches one side of the cooler causing an issue in tight quarters. Fortunately, the wheels can be stored inside the cooler when not in use. This product offers a 30 day money back guarantee. Here comes my favorite – the double axel 4-wheel version. 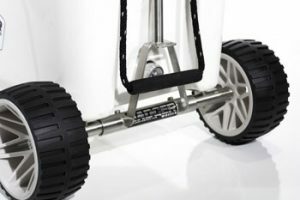 With two Badger Wheels axles, now 100% the weight of your cooler will be on the wheels; and, you can drag it to anywhere conveniently using the handle (not attached to the system). The 4-wheel kit shines brightest during long distance trips which you need to carry the heavy cooler. Badger Wheels provides its customers a 30 day money-back guarantee with a lifetime warranty. Well, it seems like this company has the better policy. Sadly, neither of RW nor BW offers the wheel kit for generator . I must say that, when it comes to the best wheel kit for cooler, both BW and RW make a great option as they deal with the weighty problem very well. Yet, after my experiment with these two systems, I would give the advantage to Rambler Wheels.